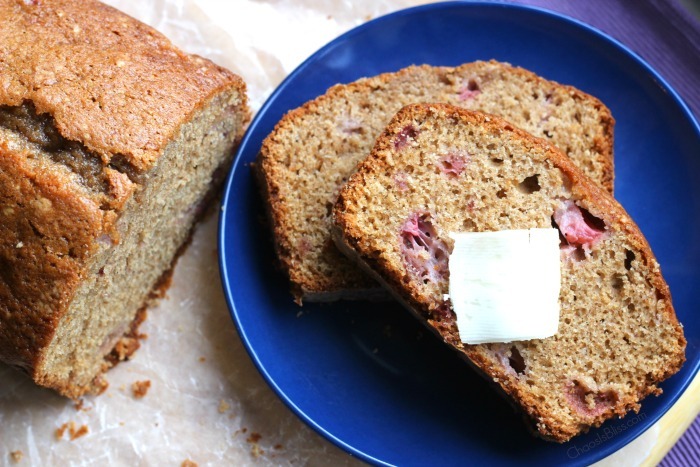 Strawberry Bread is a favorite breakfast bread using fresh or frozen strawberries. It’s super easy to make, and so yummy! When summertime hits and we start visiting the U-pick farms for strawberries, I make everything from strawberry shortcakes to this delicious strawberry bread. It’s very similar to zucchini bread (see also: Blucchini Bread), and I’ve altered it a bit by using a little applesauce along with oil, and including whole wheat flour. 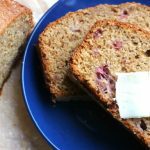 This Strawberry Bread is moist and delicious, especially warmed a bit with a spread of butter on top. 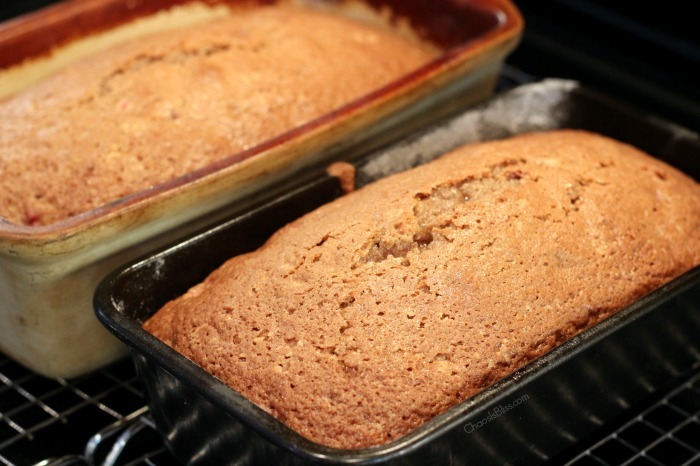 The recipe makes 2 loaves, so enjoy one and freeze the other for later, or gift to a neighbor! Preheat oven to 350 degrees. Grease and flour two 9″x5″ loaf pans. Add a little sugar (maybe a tablespoon) to strawberries in a medium-sized bowl and set aside while preparing bread mixture. Combine flours, sugar, cinnamon, salt and baking soda in large mixer bowl; mix well. Into the bowl with strawberries, blend oil, beaten eggs and vanilla. Add strawberry mixture to flour mixture on slow speed, blending just until dry ingredients are moistened. Divide batter into prepared pans. Bake for 45 to 50 minutes (metal pan closer to 45, stoneware pan closer to 50-55) until cake tester comes out clean. Let cool in pans on wire cooling rack for 10 minutes, invert onto rack and cool completely. 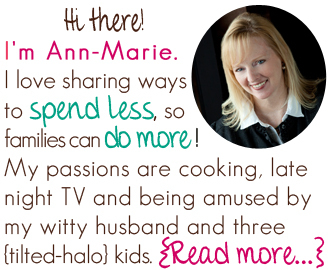 You may also like to try my Blucchini Bread recipe, or see what else I’ve been cooking lately! Strawberry Bread is a favorite breakfast bread using fresh or frozen strawberries. 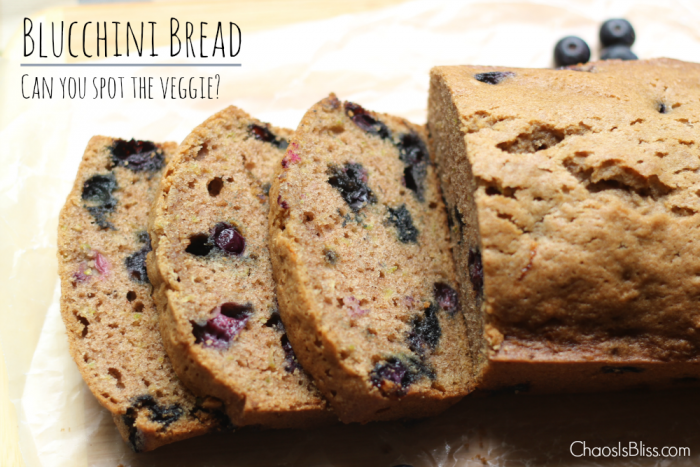 It's super easy to make, and so yummy! Grease and flour two 9"x5" loaf pans. Add a little sugar (maybe a tablespoon) to strawberries in a medium-sized bowl and set aside while preparing bread mixture. Combine flours, sugar, cinnamon, salt and baking soda in large mixer bowl; mix well. Into the bowl with strawberries, blend oil, beaten eggs and vanilla. Add strawberry mixture to flour mixture on slow speed, blending just until dry ingredients are moistened. Bake for 45 to 50 minutes (metal pan closer to 45, stoneware pan closer to 50-55) until cake tester comes out clean. Let cool in pans on wire rack for 10 minutes, invert onto cooling rack and cool completely.